The Bird of the Month is the adorable Peach-faced Lovebird! I'm happy to offer you a LOT to choose from this month, including a glass beaded necklace set, beaded bracelet, pendant without cord, pendant with cord, "normal" pin, Flights of Fancy pin, charm choker, dangle earrings, magnet and a bracelet charm all on auction on eBay for the few days. 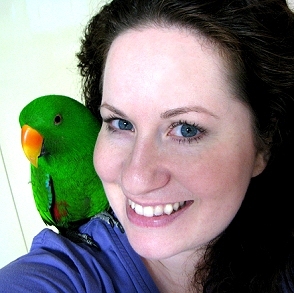 There is an assortment of other jewelry in the following species also on sale: Galah Cockatoo, Blue Front Amazon, Blue Masked Lovebird, Sun Conure, African Grey, and a few "bird poops" too, check it out! Parrot Toy Angels is an all-volunteer organization committed to providing toys, food and other avian supplies to companion birds in difficult situations. Life-altering changes, natural disasters or an organization’s lack of funding all can have a negative emotional and physical impact on both birds and companion caregivers alike. Parrot Toy Angel Projects help ease the burden for the generous individuals & organizations that provide safe havens for birds in need. There is a wonderful assortment of bird related items, things for your feathered friends as well as items for humans too, with all proceeds going to help the birds! I've donated a few pieces of jewelry, I hope you will go take a look at the auctions, and get your bids in soon! Whether you have human kids, or those of the feathered and furry variety, Killian and I (and the rest of my kiddos) are wishing all of you wonderful moms out there a very special day! Happy Hatchday Kaleena! My baby is 7 years old today!